Lunenburg Pudding from Nova Scotia is a pre-cooked sausage and, despite its name, is not a sweet but a savoury food. The original meaning of the word “pudding” in English was “sausage”, and this one is made from a combination of pork (“every part of the pig except the squeal”) and beef, with onions and a combination of “mixed spices” of which the herb summer savoury is prominent. It is presented in a casing two inches in diameter and has a shelf life of about ten days. The pudding originates from Lunenburg County, in northeastern Canada. 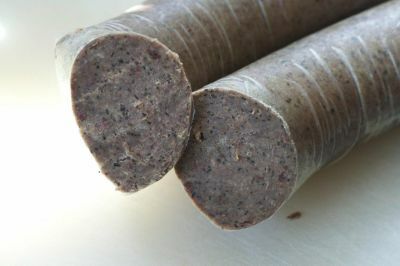 Lunenburg pudding is a cooked variant of Lunenburg sausage, and part of a distinctive local cuisine. It has been produced in this area for as long as local residents can remember, being initially made by the family cook, though now principally supplied by local businesses. Not long ago, many rural Nova Scotia families made their own sausage and pudding, sometimes with the help of a local expert, who would go from farm to farm assisting, often using a cow horn to stuff the casings. The Lunenburg community traces its roots back to Central Europe, mainly the Protestant countries of Germany, Austria, and Switzerland. The major wave of immigration to Canada happened in 1752-1753, so it is therefore most likely that the usage and recipe comes from this time period. Lunenburg pudding became more commercialized as the local fishing fleets began to recognize it as a convenient supply of protein that did not have to be cooked. It was traditionally served as part of a meal with sauerkraut and boiled potatoes, as well as being accompanied by homemade baked beans. It can often be found as an hors-d’oeuvre with Solomon Gundy (a local version of pickled herring) and various cheeses. Although produced year-round, it is most popular at Christmas time, when it is purchased in volume by Nova Scotians nostalgic for a maritime taste. The principal suppliers are local food businesses, where the pudding is produced almost daily. Distribution is limited, as the main producers choose to operate within a Provincial inspection jurisdiction rather than Federal. It is estimated that between 1500 and 1600 pounds of Lunenburg pudding or sausage is produced a week. Lunenburg Pudding is too much of a local product to be distributed nationally, and so will most likely disappear as this generation of producers passes on, if the knowledge and recipes are not preserved. It is made by local butchers, a vanishing occupation. Although many meats and meat products can be handled by central processing facilities, specialty products like Lunenburg pudding give a reason to keep the local butchering trade and small licensed abattoirs alive and well. I bought some Greek’s Lunenburg Pudding a week ago and what a disappointment! It was if they had left the spices out, bland, bland, bland. It I but it again and it is this bad I will never buy again and warn my friends. Sorry for the delayed response. Sorry to hear. I hope you’ll try it from somewhere else when you get the chance. What kind of casing should I use. I am hoping to take some Lunenburg pudding home to Calgary with me next week. I am concerned that i may not be able to keep it frozen for my flight. Can it go twelve or more hours unrefrigerated? I am just looking into some details to help you, with some folks in Nova Scotia who are better equipped to answer. Stay tuned.